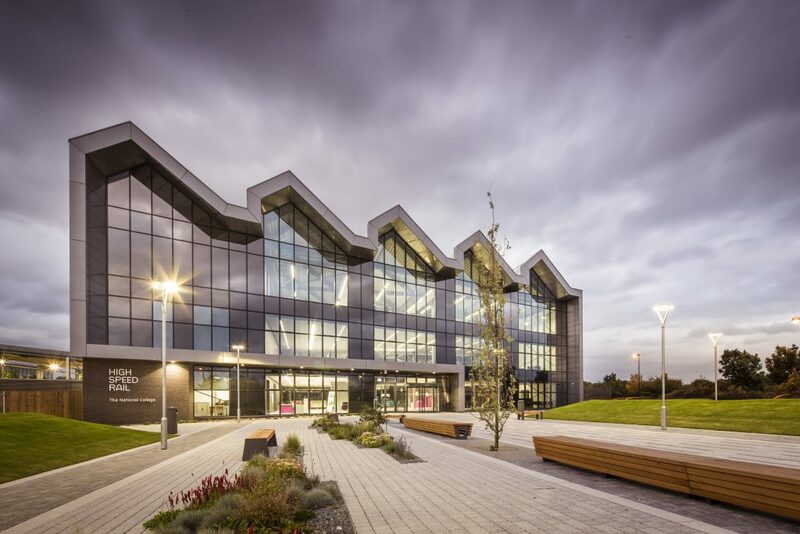 The £17m project at National College for High Speed Rail (NCHSR) is one of two new flagship academic facilities created to train thousands of engineers. It holds a BREEAM rating of ‘Excellent’ and was awarded ‘Public Sector Project – Post Construction Award’ at the BREEAM Awards 2019. The facility will produce a new generation of highly-skilled professionals to lead Britain’s future high speed rail workforce, and with the skills to take on any challenge, to help the rail industry and shape the future of our railways. The project brings a contemporary design to a commercial teaching environment and was heavily influenced by the client’s vision to create a world class facility and landmark building. The brief was delivered by designing a mixture of external and internal engineering teaching areas, along with flexible project spaces and traditional teaching rooms. The project was delivered on time and on budget to the end user full satisfaction with minimal defects. A complex structure of key stakeholder’s including the end user, National College High Speed Rail and contract customer, Doncaster Council, meant that early involvement of the assessor and excellent collaboration was key in achieving the desired BREEAM rating. With the target of BREEAM ‘Excellent’ rating and an aspiration to achieve BREEAM ‘Outstanding’, our assessors encouraged the project team to consider BREEAM as a tool for the design process rather than an after-thought or to simply make BREEAM fit the design. The project team were encouraged to take a balanced approach; with the intention to achieve more than 60% of the available credits in each issue. The building has a number of key features using innovative technologies which allowed the building to score highly across most of the BREEAM issues. The project team exceeded this target in all but one issue, going beyond in some areas, such as water scoring; 100% of all available credits. The building also pushed the boundaries and achieved 40% of the available innovation credits most notably Hea 02 Indoor Air Quality and Wst 05 Adaption to Climate Change. The building has pushed the boundaries of best practice using a well-balanced quality design providing unique learning spaces in a highly efficient and comfortable building that will stand the test of a changing climate whilst providing an economic boost to the local economy, creating jobs and upskilling the workforce. The end product delivers without question the aspirations of the College, and offers unrivalled facilities to ‘Pioneer Technical Excellence’.